Facebook Boosted Posts vs. Ads. Which is Best? 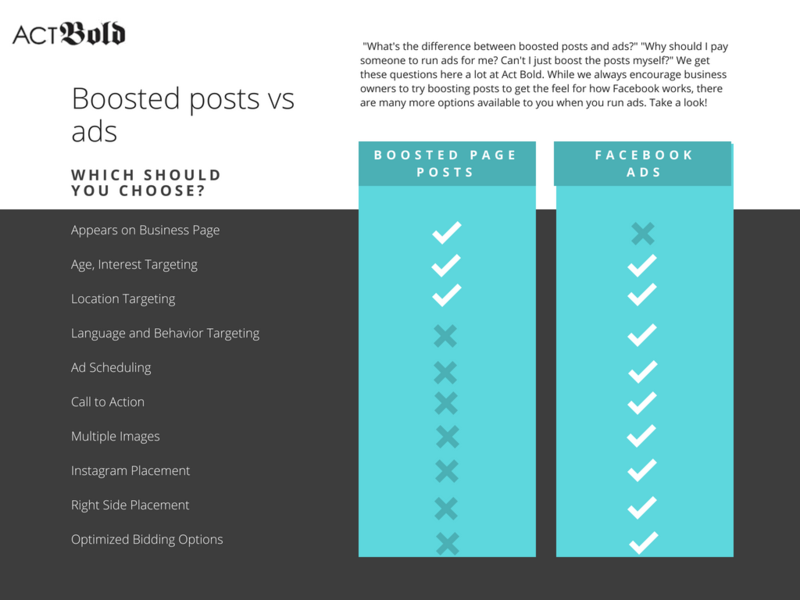 Often times we get questions from clients regarding Facebook boosted posts versus ads. What is the difference? Why should I use an ad? Should I try boosting a post myself? While Facebook ads offer a lot more customization, optimization, and targeting options, boosted posts have their time and place. Years ago, if you liked a businesses Facebook page, you’d see their posts on your timeline. But within the last few years, in an effort to increase the user experience, Facebook made changes to the platform so when a business creates a post, only 1-2% of their total audience will see it. This means that if your business page has 1,000 likes, only about 10-20 people (at most) will see it! If you are an inexperienced advertiser, you should try boosting a post to get the feel for how the Facebook ad platform works. If you create a great post on your page that you really want your followers to see, such as the case for an event or announcement, you could boost the post to your followers. So instead of 1-2% of your audience seeing it, you could get it in front of about 80% of the people who already like your page. In short, there are many differences between boosted posts and ads. But if you want the full experience of everything that Facebook offers to advertisers, you’ll want to get familiar with the ads platform. Take a look at some of the main differences below. What has your experience been with boosted posts vs. ads? Which do you prefer, and why?